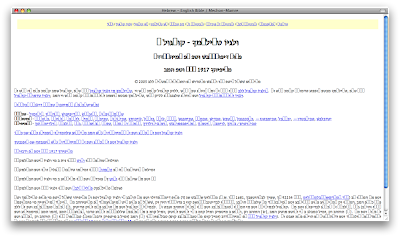 why the Mechon Mamre parallel Hebrew-English Tanakh website looks like this (see below, click to enlarge) on my Mac in Firefox now? I don't think I changed any settings. What happened and how can I fix it? This is how it looks in Safari, but I use Firefox almost exclusively, so all that helps me know is that it's a Firefox issue, not a computer-wide issue. Other Hebrew looks normal in Firefox, and when I copy and paste from the funny characters into, say, a blog post, it comes out fine. Does it have anything to do with this? I feel like it must somehow be reading this as a page of Hebrew instead of a page of English, but I don't know how to fix that. 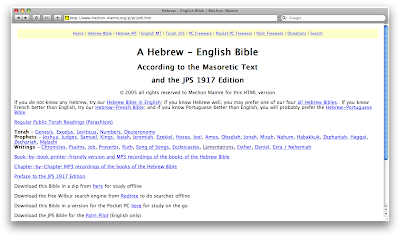 On a related note, if anyone can give me a good workaround for using Word for Mac (2004) with Hebrew text, please share! 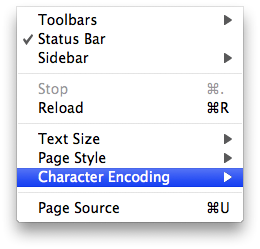 I can paste into TextEdit or a gmail message without reversing all the words in the Hebrew, but when I copy and paste from a Hebrew website either directly into Word for Mac (2004) or from TextEdit or a gmail message, the Hebrew words appear in the wrong order. I would hate to have to buy Windows just to get around this problem. Plus, I would have to buy Windows and the Windows version of Microsoft Word, which would really be irritating. I love my Mac, but due to all the learning I am doing these days, I am writing more and more in Word using Hebrew text, and I need to be able to do that. Thoughts? I was disappointed that none of my astute and well-versed blog readers had an answer to my kinah query. Oh, well. It probably isn't online anywhere, and the only way to get it electronically would be to type it out or scan it and find some Hebrew OCR software. Word doesn't support Hebrew. More correctly, it doesn't support R-> L text. Even 2008 doesn't. Look at Melllel, or use textedit, or something else. I think Nessus does it, as do some other programs. It's Microsoft's fault.. they just haven't added it in. Thanks, Matthew! That was helpful to know, so I can stop playing around with it, sure I could get it to work if I just tried a little harder. Urgh... It does seem to work just fine in Word for Windows, though. What's up with that? And any thoughts on the weird encoding problem (self-diagnosed) with the Mechon-Mamre site in Firefox? If you install Windows on your Mac, think about using Open Office instead of Microsoft Word. 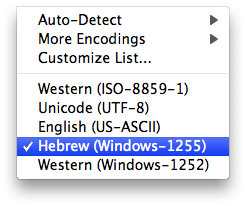 And try using NeoOffice within the Mac OS to see if that handles Hebrew better.